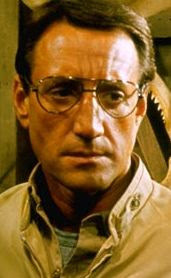 Roy Scheider starred in two bona fide American classics, “The French Connection” and “Jaws”, but it was not his presence that gave these pictures their stature. So, in a way, I start this essay seemingly negative, but only to make a point. His acting in “Jaws” is far more substantial than it is in that esteemed New York crime flick, and he gave to his Chief Brody a nice, calm human element. He was also the actor who gave voice to a true American classic line, “You’re going to need a bigger boat”, but it was his rendering of another line that I always thought was more enjoyable. At one point in “Jaws”, when it seemed the hunt for the shark was a futile venture, Quint (Robert Shaw) says to his hapless crew that they were going to head back into shore. “Thank Christ,” says Brody, and he says it with such defiant joy that every time I hear it I burst out laughing. It’s also a line that I repeat to this day. Every chance I get to agree with something that someone says or does, I say, “Thank Christ.” This is how movies sometimes actually shape who we are. 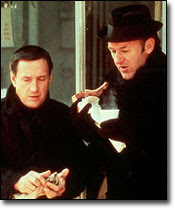 I never actually thought his performance in “The French Connection” was all that great, but maybe that was because he was sitting next to an actor, Gene Hackman, who gave one of the truly flawless acting jobs in any American movie. In it he plays Joe Gideon, the director/choreographer based solely on the director of that film, Bob Fosse. I like to think of one scene in particular, and it is when, in a quiet and reflective moment, he gives a dancing lesson to his daughter, and they talk about their lives together, and separately, and girlfriends and love. And all through the conversation Scheider is dancing with his daughter and he offers, in a totally natural way, advice on the techniques on how to be a better dancer. It’s a thrilling, joyous scene, and it is so because the writing is quite beautiful, and Scheider’s performance matches every beautiful word with his every beautiful move. I have no idea if Scheider had any training as a dancer, and he didn’t seem like he was built like one, but he gave to me, in the audience, the sense that he was a dancer to the very core of his being. And while Joe Gideon had trouble communicating with everyone in his life, he opened up in the dance studio, the place where you knew he felt most comfortable and honest and at home. That’s what he brought to that role and that movie. I adore that scene, and so many more in that movie. He was nominated for a Best Actor Oscar for that role, but sometimes that accolade seems paltry to the actual achievement. It’s by no means a perfect film. The musical ending, the death of Gideon, goes on too long, tipping ever so slightly what should have been an exuberant finale into something bordering on self-reverence. I know people who have seen the film will think that’s being too generous, but I can’t help it if the film works so well for me. It’s something I can watch over and over, and part of that unending enjoyment is watching Roy Scheider, in an atypical role, shining, shining not just like a movie star, but also like a very great actor. It may not seem like much, as it is in the shadows of “Jaws” and “The French Connection”, because everyone this week has been focused on those two films. But those classics were made, and belong, to other people. “All That Jazz” is, finally, Scheider’s own, and he owns every bit of it. It is nice to give him that, and it is even nicer that Roy Scheider gave that to us. His performance is the kind of gift American movies bestow upon us every once in a while.